The identification of genetic factors associated with kidney disease has the potential to provide critical insights into disease mechanisms. Genome-wide association studies have uncovered genomic regions associated with renal function metrics and risk of CKD. UMOD is among the most outstanding loci associated with CKD in the general population, because it has a large effect on eGFR and CKD risk that is consistent across different ethnic groups. The relevance of UMOD for CKD is clear, because the encoded protein, uromodulin (Tamm–Horsfall protein), is exclusively produced by the kidney tubule and has specific biochemical properties that mediate important functions in the kidney and urine. Rare mutations in UMOD are the major cause of autosomal dominant tubulointerstitial kidney disease, a condition that leads to CKD and ESRD. In this brief review, we use the UMOD paradigm to describe how population genetic studies can yield insight into the pathogenesis and prognosis of kidney diseases. CKD is a global public health burden, affecting as many as 10%–15% of the population worldwide and exceeding 20% in individuals about 60 years old.1 Even in the early stages, CKD is associated with increased prevalence and severity of multiple disorders and adverse outcomes, and it is a major risk factor for accelerated cardiovascular disease and aging.2 Very few pharmacologic interventions have been developed specifically for treating CKD, primarily due to the lack of mechanistic understanding and the lack of biomarkers reflecting the severity of organ damage. Among all of the loci associated with CKD in the general population, the UMOD one is of particular interest due to its large effect on both eGFR and CKD risk, the consistency of the effect across different ethnic groups, and its relationship with age.33 The relevance of UMOD for CKD is immediate, because the encoded protein, uromodulin (Tamm–Horsfall protein), is exclusively produced by the kidney tubule and has specific biochemical properties that sustain its role in the kidney and urine. Furthermore, rare mutations in UMOD are the major cause of autosomal dominant tubulointerstitial kidney disease (ADTKD), a condition that leads to CKD and ESRD.34 Because UMOD is involved in a continuum between rare mutations and common regulatory variants, physiologically relevant, biochemical investigations of uromodulin are essential to understand its complex role—in the kidney and beyond. This brief review will describe how population genetic studies evidenced risk loci for CKD and related traits and will use the UMOD paradigm to show how this genetic signal may yield pathogenesis and prognostic insights into kidney diseases. In contrast with the successful GWASs of CKD-defining traits, it has been difficult to perform GWASs of clinically defined CKD (i.e., kidney damage or GFR<60 ml/min per 1.73 m2 for at least 3 months).2 Taking into account the heterogeneity of disease etiologies and the small genetic effects that are anticipated for complex diseases, such as diabetes or hypertension, GWASs of clinically defined CKD require large sample sizes that are realistically difficult to obtain.12 To overcome the sample size issue, cross-sectional studies carried out in the general adult population were used.15,22,28 In these studies, CKD 3+ was defined as eGFRcrea<60 ml/min per 1.73 m2 on the basis of a single serum creatinine assessment. No genome-wide significant loci have been identified out of those already reported as significantly associated with eGFRcrea.13,15,20,22,26 Attempts to decrease the eGFRcrea threshold to 45 ml/min per 1.73 m2 did not successfully identified new loci due to lack of power.20 Cross-sectional studies may perform GWASs on CKD stage 3+, but they would miss patients with the most severe cases of CKD stages 4 and 5. Conversely, enrichment for patients with ESRD would then miss the earlier, asymptomatic stages of disease. A recent transethnic analysis showed that most of the eGFRcrea-associated loci are associated with increased risk of CKD defined as eGFRcrea<60 ml/min per 1.73 m2 or incident ESRD.28 Böger et al.43 showed that most of the eGFRcrea-associated loci were also associated with incident CKD or ESRD after 7 years median follow-up. Taken together, these findings support the evidence that, although it is challenging to perform gene discovery analyses on clinically defined CKD, the analysis of CKD-defining traits is providing insight into the biologic pathways underlying CKD. An overview of the effect of different genetic loci on CKD for different ethnicities (Europeans, Asians, and multiethnic) is given in Figure 1. In general, odds ratios (ORs) are small, indicating that each additional copy of the risk allele at each locus confers only a modest increase in the risk of CKD. Just a handful of SNPs would have shown genome-wide significance in a GWAS of CKD, including UMOD, PRKAG2, CPS1, ALMS1-NAT8, and GATM in Europeans (Figure 1A) and WDR72 in Asians (Figure 1B). Among these, loci, such as GATM for instance, reflect the creatinine production pathway11 and probably have little to do with the risk of CKD. Notably, several loci are associated with CKD across ethnicities, including UMOD, SHROOM3, MPPED2, BCAS3, and UNCX. The analysis also indicates that the P value criterion, which drives GWAS discovery, does not reflect effect size but precision. Loci with small but consistent effect across studies will get lower P values than loci with larger but variable effect between populations, maybe because of population-specific features increasing heterogeneity of genetic effects. The UMOD locus stands out among the loci associated with CKD. In European ancestry individuals, UMOD was the first locus uncovered in association with eGFRcrea, and it was already associated with CKD at a genome-wide significance level.13 CKD association at the UMOD locus is related to the three SNPs in linkage disequilibrium located in the promoter. For these SNPs, the “risk” allele is the common allele, which has a frequency of approximately 80% in Europeans.44 As shown in Figure 1, UMOD shows the largest OR for CKD compared with all other loci in nearly all ethnicities. The OR for CKD is 1.24 (95% confidence interval [95% CI], 1.19 to 1.29) per copy of the UMOD risk allele,26 rising up to 1.35 (95% CI, 1.18 to 1.54) if eGFRcrea<45 ml/min per 1.73 m2 is considered.20 UMOD is, to date, the only locus associated with incident CKD at a genome-wide level of significance, with an OR of about 1.3 per copy of the risk allele, which remained unchanged after baseline eGFRcrea adjustment.43 Furthermore, UMOD is also associated with incident ESRD.43 If all eGFRcrea loci together explain nearly 4% of the trait variance,31 >1% is explained by UMOD alone. Accordingly, UMOD accounts for 25% of the eGFRcrea variability explained by genetic factors. The prior knowledge about uromodulin paralleled by genetic evidence involving UMOD in rare kidney diseases and by translational studies has sustained the biologic relevance of the association of UMOD with renal function and CKD. Milestones in the discovery of Tamm–Horsfall/uromodulin protein and the UMOD gene from the XIXth to the XXIst century. ER, endoplasmic reticulum. The UMOD locus is associated with eGFR and CKD in the general population. The promoter SNPs constituting the risk haplotype drive increased transcriptional activity and higher levels of uromodulin in kidney and urine and in blood.44,67 Accordingly, one could expect that higher levels of uromodulin would be associated with higher risk of kidney damage in epidemiologic studies. However, recent prospective studies showed that higher levels of uromodulin are protective of kidney damage in at-risk cohorts.67–69 How can we explain these seemingly opposite predictive values of uromodulin levels for the risk of kidney disease (Figure 3)? Interpretation of the uromodulin biomarker versus UMOD genotype studies. In observational epidemiologic studies, uromodulin levels largely reflect kidney mass at baseline. Higher levels of uromodulin in urine, representing a higher renal functional reserve, are as such associated with a positive outcome in prospective studies conducted in at-risk individuals. Conversely, decreased levels of uromodulin reflect decreased production and lower functional reserve at baseline. This situation (i.e., when it is the disease [kidney damage] that affects the studied risk factor [uromodulin level]) is typical of reverse causation. In turn, reverse causation represents a bias when evaluating the causality of the UMOD risk haplotype in promoting CKD. Genetic, experimental, and statistical studies in healthy individuals have shown that the UMOD risk haplotype drives the expression of uromodulin in the kidney and its level in urine. The use of analytic methods, such as Mendelian randomization, will provide a valuable opportunity to assess the causality of the UMOD genotype and higher uromodulin levels as a risk factor for CKD. ER, endoplasmic reticulum. The value of uromodulin as a biomarker originates from its exclusive production by a tubular segment of the kidney, with sizeable levels being detected in normal urine.70,71 Observational studies carried out in the general population showed that urinary uromodulin levels are positively associated with eGFR, markers of tubular transport, and kidney length and volume, suggesting that urinary uromodulin is a biomarker for tubular mass and function.72 A fraction of uromodulin produced in the TAL is released into the circulation.73 Plasma uromodulin concentrations, which are approximately 1000 times lower than urinary levels (nanograms per milliliter versus micrograms per milliliter, respectively), correlate positively with urinary uromodulin excretion and creatinine clearance in patients with CKD.74,75 The levels of uromodulin can thus be considered as biomarkers of kidney tubule function, with higher levels reflecting higher renal functional mass (Figure 3). From the above, it can be hypothesized that low urinary uromodulin is a marker of poorer tubular health: in at-risk individuals (aged and early CKD), decreased levels of uromodulin reflect decreased production (i.e., decreased renal functional reserve). The latter hypothesis is supported by the studies of Garimella et al.,68 which measured urinary uromodulin levels in 192 participants of the Cardiovascular Health Study over 9 years. Each one SD increase in urinary uromodulin was associated with a 23% lower odds of eGFR decline and a 10% lower risk of mortality. Similarly, lower preoperative urinary uromodulin levels were associated with higher risk of postoperative AKI.69 In these at-risk individuals, decreased levels of uromodulin reflect decreased functional reserve. The latter situation is typical of reverse causation (i.e., when it is the disease [kidney damage] that affects the studied risk factor [uromodulin level]) (Figure 3). Such a situation would then constitute a bias when evaluating the causality of the UMOD genotype and the uromodulin levels in relation to the outcome. 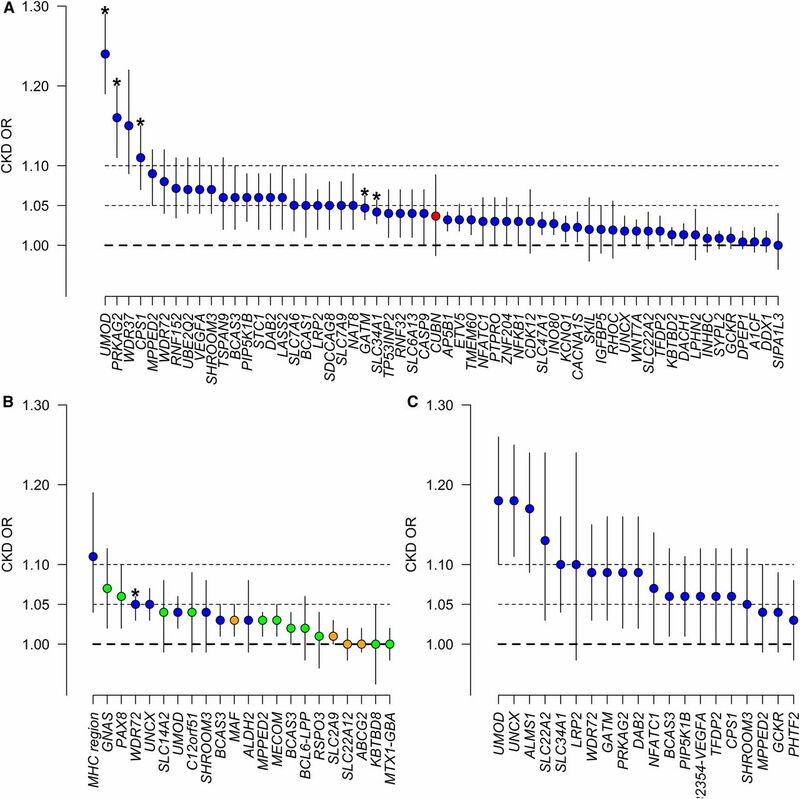 The use of analytic methods, such as Mendelian randomization, will provide a valuable opportunity to assess the causality of higher uromodulin levels as a risk factor for CKD.76 Furthermore, even if the UMOD variants show the largest effect size among all known loci for eGFRcrea and CKD, their effect is clearly age dependent and contributing only to a small part of the overall risk of kidney damage, together with many other genetic and environmental factors. 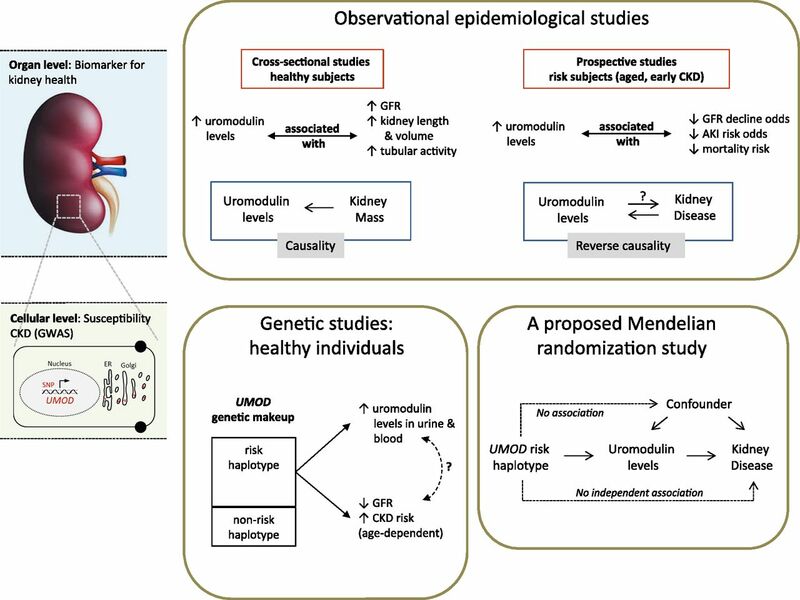 Especially regarding age and CKD status, Mendelian randomization studies should take the stratification of study subjects into account to depict a conclusive picture of the causal relation between uromodulin levels and disease risk. Also, one should keep in mind the possibility that the UMOD SNPs may still have additional effects, unrelated to the production of uromodulin, involved in the association with renal disease. The small effect of each individual GWAS locus reflects the polygenic theory that complex diseases are driven by a blend of different pathways, each one responsible of a minimal fraction of the risk of the disease.85,86 This does not mean that genetic findings have little clinical relevance. In fact, as already reported by Köttgen et al.,15 a genetic risk score on the basis of the first 20 loci identified was associated with the doubling of CKD prevalence from about 5% to about 10% in the general population. In addition, regardless of the effect size, each gene identified shed light on a particular pathway. Each of these pathways has the potential to become a therapeutic target to prevent CKD as illustrated in the field of coronary artery disease, where large-scale genetic investigations paved the way to release of targeted therapies into the market.87 In line with such a “blend” theory is the observation that eGFRcrea is not the only phenotype that should be used to uncover genetic loci for CKD: Okada et al.22 showed that loci associated with uric acid and BUN may be associated with CKD at a similar magnitude as eGFRcrea loci. Also, larger meta-GWASs of uromodulin levels may be useful to uncover mechanisms involved in uromodulin production and/or release from TAL cells. In turn, these factors may be viewed as additional traits reflecting renal tubular health. In conclusion, UMOD has been identified as one of the most outstanding loci associated with renal function parameters and risk of CKD in the general population. Multidisciplinary studies have shown the biologic relevance of the top UMOD variants, which are also associated with hypertension and kidney stones. The fact that UMOD encodes a protein that is exclusively produced by a subset of renal tubular cells and abundantly excreted in the urine offers a unique situation to address the causality between UMOD variants, production of uromodulin, its levels in urine and blood, and risk of disease. These studies should also address the potential of rare variations in UMOD to explain its overall contribution to kidney disease. Examination of public databases, such as the Exome Aggregation Consortium and the Genome Aggregation Database, reveals that UMOD is not mutation intolerant, and there are a fair number of people who have severe UMOD mutations (stop gained, missense involving cysteine residues, or frameshift). Phenotype studies of such individuals may reveal more about the biology of the protein and potential reasons for selection. Considering that the top UMOD variants show pleiotropic effects on multiple phenotypes, a phenome-wide association study approach may uncover additional clinical associations94 and reveal biologic underpinnings involving this fascinating gene. We thank Guido Barbujani, Anthony Bleyer, Murielle Bochud, Kai-Uwe Eckardt, Caroline S. Fox, Barry Freedman, Anna Köttgen, François Madore, Eric Olinger, Belen Ponte, Menno Pruijm, Luca Rampoldi, Rajesh V. Thakker, Stephane Troyanov, Peter Vollenweider, Gérard Waeber, and Sonia Youhanna for fruitful discussions. O.D. is supported by the Swiss National Centre of Competence in Research Kidney Control of Homeostasis program, Swiss National Science Foundation grant 31003A_169850, and the Rare Disease Initiative Zurich (Radiz), a clinical research priority program of the University of Zurich.